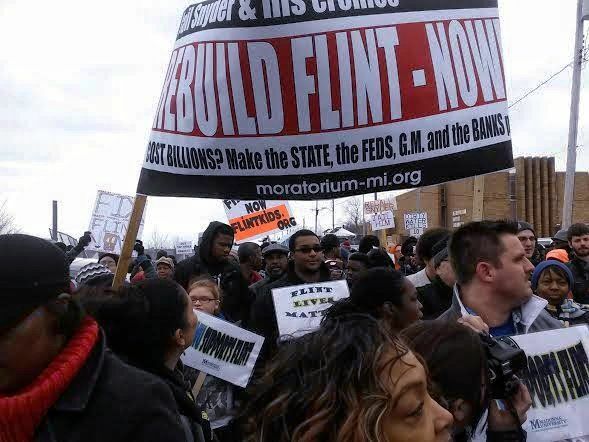 Flint, Mich. — “Rebuild Flint” was the theme of a mass demonstration Feb. 19 called by TV Judge Greg Mathis, originally from Detroit; the Rev. Jesse Jackson; and Flint’s Concerned Pastors for Social Action. One media source estimated there were “thousands,” mostly Flint residents. (mlive, Feb. 19) The church that hosted the pre-march rally was overflowing. The strongest message on signs, shirts and hoodies was “Flint Lives Matter,” linking the brutality of trigger-happy police with the environmental racism that contaminated Flint’s drinking water and perpetuated the lie that it was drinkable. 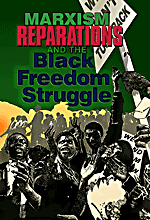 This was the largest action so far in the growing movement to demand justice for this majority-Black city. The whole world now knows how Flint was lead-poisoned by a racist governor, aided by governor-appointed dictators called emergency managers and cronies with no scientific background at the misnamed Department of Environmental Quality. Judge Mathis demanded the $600 million in federal aid that the U.S. Senate is debating be released. Referring to the state budget surplus, he led the crowd in this chant, “The surplus is for us!” Rev. Jackson demanded lead testing be made available for everyone. Because toxic Flint water was allowed to go untreated for 18 months, letting lead leach into the water supply, all the pipes are corroded and the water infrastructure needs to be rebuilt to make Flint’s drinking water safe again. Between the budget surplus and the “rainy day” fund, the state has at least $1 billion and could begin the process now. But the legislature and Gov. Rick Snyder, who finally acknowledged the lead problem in October and declared a state of emergency in January, are sitting on the funds. “Today we stand up for environmental justice, we stand up for ourselves, we stand up for our rights,” said Melissa Mays, founder of Water You Fighting For. “At the end of the day we’re sick, we’re tired, we’re broke, we’re fed up, but at the end of this march we will all know we are not victims. We are fighters.” Mays and her three children are all sick as a result of the water contamination. The latest water-related tragedy in Flint is the death of two teenagers who died after smoking marijuana through a water-based bong. Lead residue accumulated in the water pipe during the 18 months residents were told the water was safe. Inhaling the metal, unsafe at any level, caused their deaths. The death toll is now at least 11, counting nine people who died from a Legionnaires’ disease outbreak blamed on the water. The Baltimore People’s Power Assembly held a Flint solidarity demonstration Feb. 19 and the New York City PPA followed suit on Feb. 21. A demonstration is planned in Los Angeles for Feb. 25. Activists hold weekly pickets of the governor’s condo in Ann Arbor, calling for his arrest. A mass convergence on the state Capitol is planned. The state is not meeting even the minimal needs of the population for bottled water, despite activating Michigan National Guard troops and using fire stations as water distribution centers. Solidarity donations from churches, mosques, synagogues, unions, schoolchildren, celebrities, individuals and even prisoners are keeping residents alive. Underserved communities — the undocumented, people with limited mobility and those in the poorest neighborhoods — still depend on dedicated volunteers who go into their homes and do needs assessments. Flint was already suffering before being poisoned. The city had the highest poverty rate in Michigan at over 40 percent. Almost 20 percent of the population of “Vehicle City” has no access to a vehicle. Flint’s job crisis was the subject of a front-page story in the Feb. 21 Detroit Free Press. Every zip code in the city has lost jobs since 1998, with zip code 48505 losing 72 percent. Half the working population must travel over 25 miles to get to work in the suburbs. General Motors stripped Flint, the city where it was founded, of most of the jobs that made Flint a prosperous working-class city of 200,000. That and the foreclosure crisis drove half the population away. The protest march passed by the former site of the Buick City complex, opened in 1985 with a workforce of 28,000, only to be shuttered and demolished seven years later. More than 150 businesses have closed in Flint, many as a consequence of GM’s pullout. Members of Detroit’s Moratorium Now! Coalition to Stop Foreclosures, Evictions and Utility Shutoffs received many positive comments to a leaflet calling for Snyder’s arrest and demanding GM pay $4 billion — out of its $9.7 billion record profits for 2015 — in reparations to Flint.